Occasionally in the offseason, blogs or sites will run previews and or pieces as part of a build up to the coming season. Consider it your e-tease for the football season right around the corner. This week saw two mentions of the Cardinals, both of which had a small touch from OTP, since we were asked to contribute a bit of information to both. First up for Cardinals fans come from the Yahoo! Sports blog Dr. Saturday, as Doug Gillett checks in with his embattled coach series. 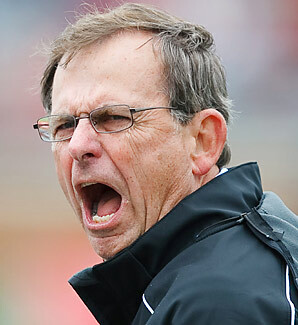 Doug reached out to OTP for a bit of insight into the fans’ minds about Stan Parrish, making note of the fact that most second-year coaches wouldn’t be included on any sort of hot seat list, but Stan and the drastic turnaround from 12-0 to 2-10 raised some eyebrows. You can check out the entire piece here, as well as OTP’s comments, which were plentiful. Ultimately, whenever the question is asked of us about the job security of Coach Parrish, we say there is no worry at all that he will be fired. Hopefully because of a remarkable turnaround in terms of wins this season, but also because the threadbare budget at BSU is what it is and is incapable of buying out any contract whatsoever. Either way, Stan’s safe for at least another year. But let’s hope for the wins, shall we? Next up for linkage and previewage is the new CFB blog College Football Zealots. They asked for several key components of the 2010 Cardinals, like what is our biggest concerns (linebackers and oline) as well as who we would look to for the biggest impact who wasn’t around last year (Artis Chambers). You can check out the rest of the answers we gave and agree or disagree accordingly here. Enjoy yourself. The final linkage to pass on for today is from Iowa blog Black Heart Gold Pants, one of the best CFB blogs out there, assuming you like humor. And Iowa. It’s their “Better Know a 2010 Opponent” series previewing the upcoming season for the Hawkeyes. Part one you can check out here and part two here. BHGP doesn’t seem to think the Cards are going to give the Hawkeyes much of a problem, and considering they’re a consensus Top 10 pick and we sucked something awful last year, I can certainly see why they would think that. The curious thing about teams that don’t have a national following or are a relative unknown entity is that the results of the prior year dictate the expectations of the current. That’s a dangerous game, and an especially dangerous one with this Ball State team. I wish I had something concrete or firm to throw back at people who think we will suckle from the losing teet again, but alas, there is no “Q.E.D. MFer” type of stat to throw at them. It’s just a gut feeling. Alan, are you sure that Artis Chambers is still on the team? Both him and Kurt Wermers transferred from Michigan at the same time and neither one are listed on the 2010-2011 roster.